Last year alone SPARK raised over $100k through employee matching programs! Taking advantage of your company’s corporate match program is a great way to increase – and in many cases double – your donation to SPARK! Our new company search tool makes it easy to check if your place of business participates with corporate match. Any questions that we can answer? Email us at info@SPARKSchools.org. 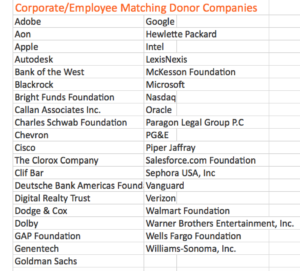 The companies listed below have recently donated to SPARK by generously providing a corporate match to District family Annual Giving donations.